I have been trying to use Saturdays as a day to practice my photography. 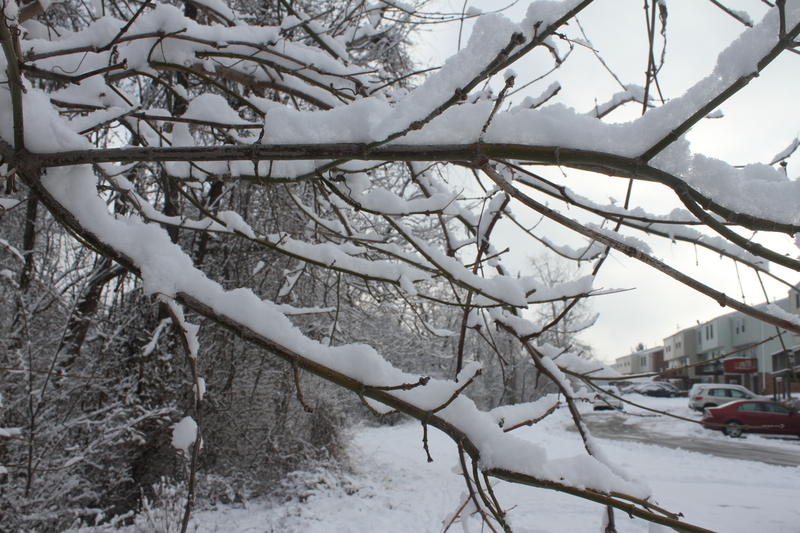 Today was no exception but this morning offered me some snow pictures. 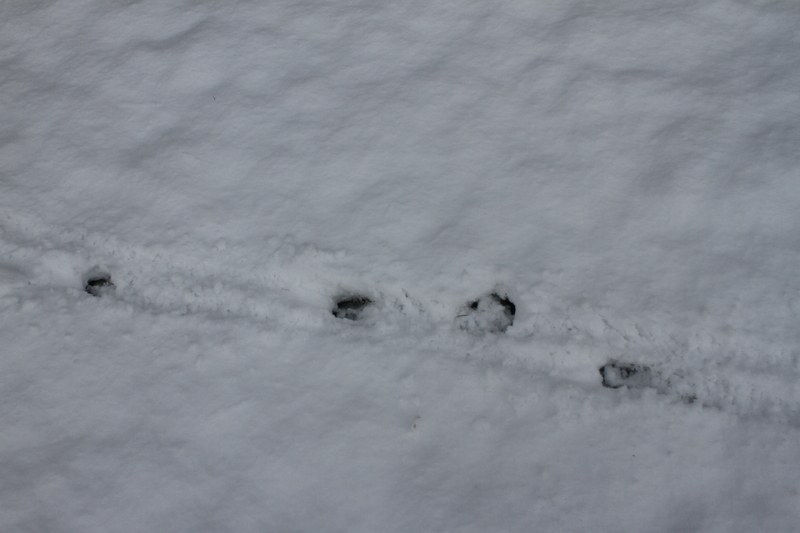 We haven’t had much snow here so it was nice to wake up and see 3 inches of new fallen snow. 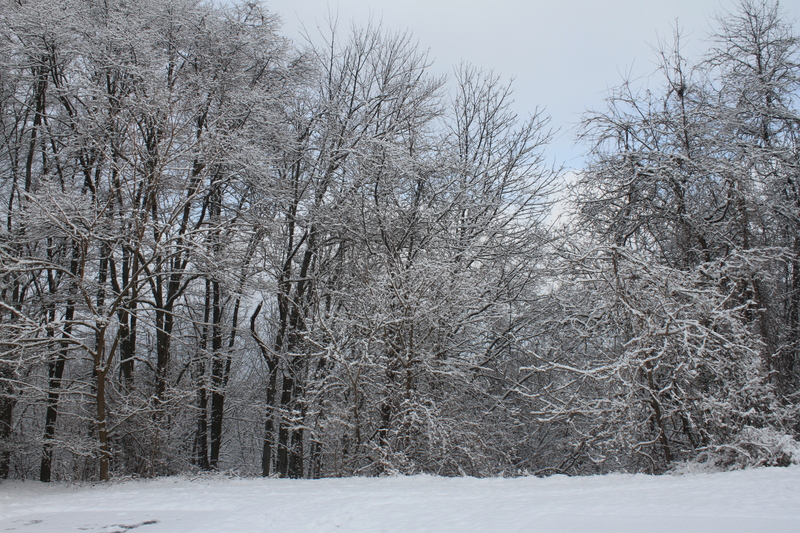 Kibbles and I went out and the snow seemed to cling to the trees and the blue skies made a beautiful background. 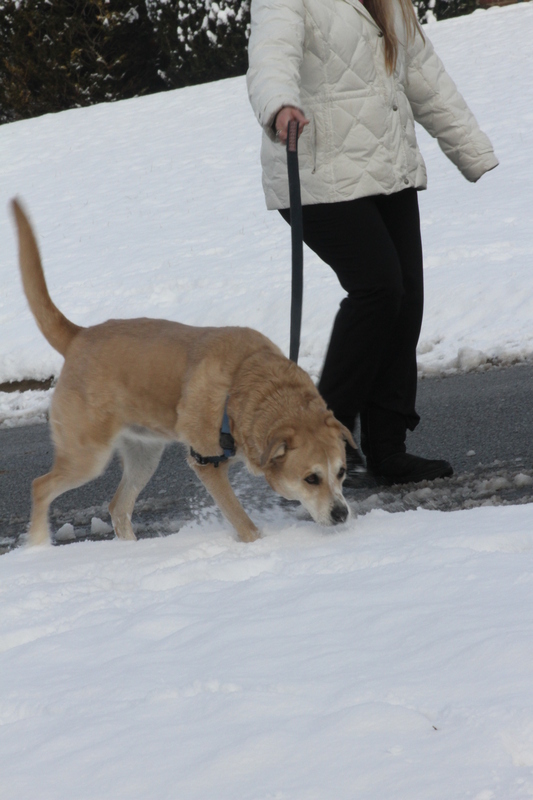 The nice thing about weekend snowfalls is you can stop and chat with the neighbors as they walk their dogs or shovel the sidewalk. The past week has been a trying week not because of the business of work or home. It was the just the fact that I went to work everyday but was not able to do much else. I came home every day and took a nap then went to bed but felt like I never had any sleep. I had a virus but was not ill enough to take off work. I am grateful I was able to continue to work but sad not much else was accomplished. It finally happened we had our first snow event. It also brought with it frigid temperatures and I think the high with the wind chill was 19. This was not the magnitude of a Buffalo snow but somehow 2 inches made the road conditions as bad as 2 feet. 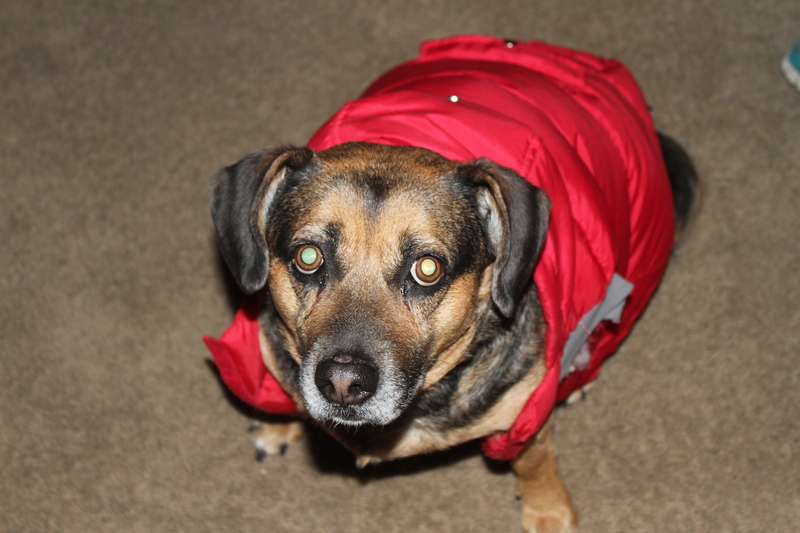 Due to other circumstances I was not able to go to work today but I did have to go out and walk the dog. It was the moon and there were no stars in the sky. 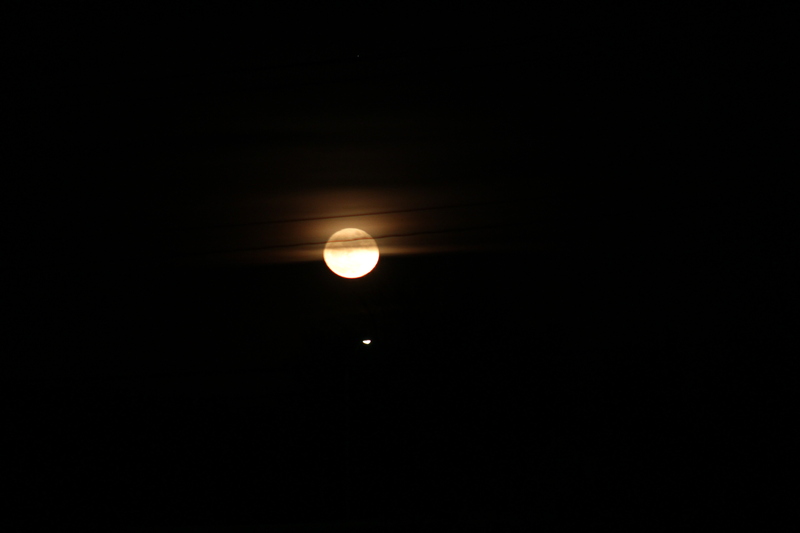 The picture did not totally capture the beauty of the orange moon which lit the sky. The snow came and dusted the area this morning and quit this afternoon. 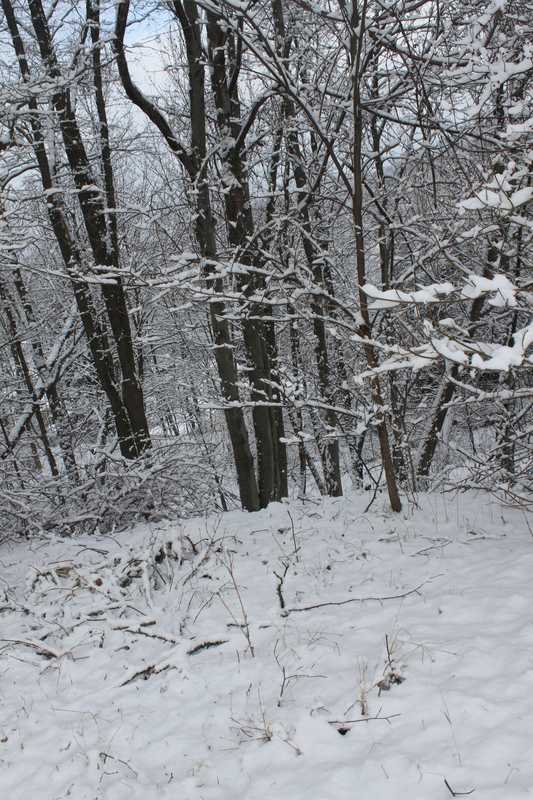 I have to admit I do like snow in December and January but then am no longer enamored with the white fluff. 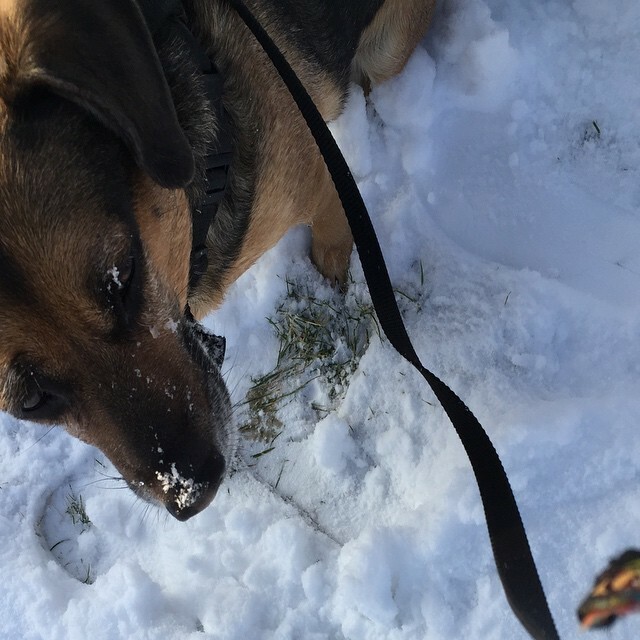 Kibbles on the other hand loves the snow and likes nothing better than to bury her snout in it. 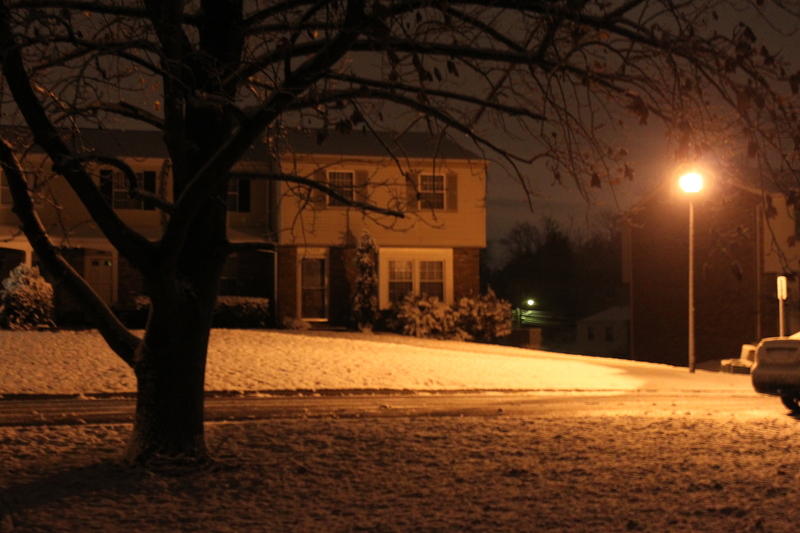 I did manage to take a picture of the snow tonight. I do want to continue doing my weekly gratitude list. It is one of my favorite posts to write each week. I think that recapturing the good moments makes me feel positive and thankful. my eyes are healing well and I was able to have my last appointment on Friday. The doctor said there is no permanent damage but no contacts for 4 more weeks. I can live with that. Having the ability to have my family here at Christmas. We had a wonderful brunch and conversation. Receiving beautiful gifts from my family and friends: jewelry, decorative pillows for my living room, cozy warm slippers, candles, lotions, a lighted snowman, books and gift cards . I am truly blessed. Having my new washer and dryer. It was a long process to get them both installed but well worth the wait. I enjoyed the holidays but happy the decorations are down and put away until next year. What is on your gratitude list? 5. Run 3 races this year. 1.Go on a 30 day spending freeze for non-essential items including packing my lunch, taking my morning coffee. 2.Take more of an active interest in my retirement account. 1. Restart my blogging at least 5 days a week. 3. Read at least 2 books a month. First I would like to wish everyone a Happy 2015 and hope it brings happiness, health and blessings. This past three weeks have been a gamut of emotions. December 17th was a typical day of work then I decided I needed to do some last minute errands. I ended up staying out a little later than anticipated so when I came home I was unable to clean my contacts as I always do and stored them in another case. I thought for a moment about using a new case but thought it would be fine for just 1 night. I woke up and put my contacts in the next morning. Everything seemed fine. I arrived at work and noticed that there was a film on my left eye. I attributed it to my contact so I removed the contact and cleaned it. I went through the day but that film never left. Why I did not remove the contact is beyond me but it is a decision I would come to regret. When I left work I went outside and it looked like fog had rolled in the city. I was afraid to ask anyone if it was fog. Thinking back I now realize I knew something was wrong. Finally made it home and took Kibbles out. Everything still looked hazy so I decided to take out my contacts. I took the left out first and felt a burning sharp pain in the eye. I looked and realized my left eye was blurred. I could not make out any features just shapes. My right eye was still ok until 30 minutes later when I noticed the blur beginning. I immediately called my eye doctor and she told me to come right away. I of course decided I needed to drive myself until I went out on the road. The headlights appeared as prisms and the colors prevented me from seeing. Thankfully, my guardian angel was there to guide me back home. Now I was frightened as my worst fear was this would now be my vision. I knocked on my neighbor’s door but they were not home. My next thing was to call my son and luckily they were out but came and drove me to the eye doctor. The diagnosis was corneal erosion. I somehow mixed up my contact solution and put hydrogen peroxide in my eye. The result of this mistake was taking the first layer of the cornea off. The good news was hopefully it would heal. I finally regained my vision 4 days later. It has involved antibiotic drops, eye ointment and eye drops as well as multiple visits to my eye doctor (in fact I have another one tomorrow). Everything seems to be progressing nicely and the corneal tissue has regrown. I consider myself blessed and fortunate. I have subsequently talked to people who have had permanent partial vision loss. It still bothers me to be on a computer for a long period of time but that too can be a blessing. I still am not permitted to use my contacts so I have to wear my glasses but that is a little price to pay for what could have been. I have now separated all the solutions so that mistake can never be made again. The old contacts and cases have been tossed. I learned a valuable lesson and will be more careful in the future. It seems like a whirlwind since Thanksgiving. Shopping decorating and trying to fit work in as well. I realized today, as I sat sipping my hot tea, that my gratitude list is so full. Sharing Thanksgiving with friends and family-laughter and great conversation filling my home. My washer breaking after 18 years may not seem like something to be thankful for but having it break when there are great sales is a good thing. I bought a washer and dryer just due to the fact my dryer was ready to go as well. It will be delivered tomorrow-just in the nick of time. Who new that one person could have so much laundry in 10 days. Spending time decorating with my granddaughter. She has her own special Christmas tree and we spent time decorating. She put all her favorite ornaments on the tree then directed Gram where the rest should be placed on the tree. Decorating the rest of my house and having the lights and decorations adding the feeling of peace and calm to the house. With delivery scheduled tomorrow having to clean the basement forcing me to take a hard look at the things I saved and finding I have and can live without them. Planning time for a get together with some friends. Shopping and enjoying spending time picking out special things for loved ones. A wonderful performance review by my boss. It is always nice to be appreciated.